Do you want to refine your search? YEAH! FINALLY THERE IS A JOB BOARD FOR HOUSEKEEPING PROFESSIONALS! Finding the next great job can be difficult and time consuming. 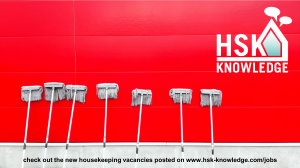 If you are looking for housekeeping vacancies, hsk-knowledge.com/job is the right starting point. Check out the vacancies listed on the left – you can use the search function to filter the results. By clicking on the vacancy you will be redirected to the vacancy details page. In case you want to speed up the application process and want to ensure employers can search your resume, please register as a candidate. NEW: Looking for housekeeping vacancies in GERMANY? Click here! NEW: Looking for housekeeping vacancies in INDIA? Click here! NEW: Looking for housekeeping vacancies in QATAR? Click here! NEW: Looking for housekeeping vacancies in SAUDI ARABIA? Click here! NEW: Looking for housekeeping vacancies in THE NETHERLANDS? Click here! NEW: Looking for housekeeping vacancies in UNITED ARAB EMIRATES? Click here!